In the 21st century, architects often talk about prefabricated buildings as large assemblies of the final construction that are delivered to the project site, craned into position, and finished on site. This notion of prefabrication is correct, but it begins to create a specific typology and form in the minds of the mass population. The moment someone hears the phrase, prefabricated house, a majority of the population imagines a home that’s made of shipping containers or rectilinear modules that are connected on site. However, there are different tiers of prefabrication that start from individual parts that come together into a component and eventually combined into an assembly that becomes the final product. Having a deeper understanding of the term “prefabrication” will allow us to utilize more efficient methods of building and shift the preconceived notion behind the terminology. Let me explain. Let’s frame this article in the perspective of Ray and Charles Eames who created a well-known video on the power of 10 where they show the relative size of things in the universe in a series of views 10x further away and closer to the original frame of a picnic by the lakeside in Chicago. When we think about prefabrication, the popular notion that comes to mind due to the trends depicted in media are a series of assemblies coming together to form the whole. In this case, the finished prefabricated project represents the whole which is the complete project. Getting to this point requires assemblies that are comprised of various components ready to be lifted into place at the project site. In most cases, these assemblies are at least 80% complete with interior finishes, built-in millwork, structure, sub floors, ceilings, and so on. Once the assemblies are lifted into place on its foundation, which is constructed concurrently as the assemblies are being made at a warehouse or factory off-site, they’re connected to one another to create a structurally sound building. After the connections are made, exterior and interior finishes commence, which is done in a short amount of time. Prefabricated assemblies allow architects and contractors to construct a precise building in a very efficient manner within a controlled environment. They could be built year-round because they’re constructed within warehouses and factories before being delivered, erected, and finished on site. The process is easier to manage than traditional ways of building and also allow contractors to work in safer environments. Let’s zoom in on an area of prefabrication that was a major focus of the mid-19th century and now in the 21st century is building components. 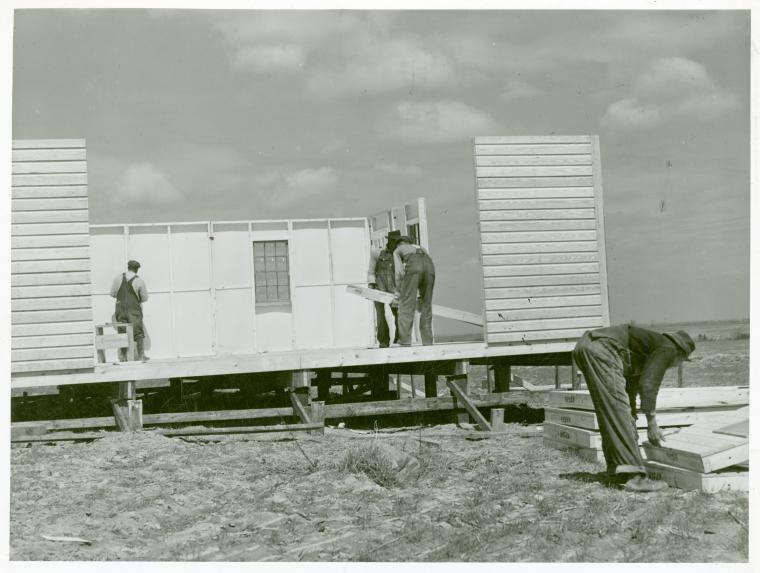 During the time of Walter Gropius and Konrad Wachsmann, prefabricated components was one of their prime focuses where they developed systems that can come together to build a house in a short amount of time. Starting in Germany, Gropius developed prefabricated components for the copper house company where all of the layers in an exterior to interior wall panel were brought together in a single piece that could be attached to adjacent pieces to form the enclosure of a house. Although the copper house project was scrapped by the company, Gropius and Wachsmann eventually met one another and started a venture together with the General Panel System that eventually became the General Panel Corporation. Their designs were similar to the copper house designs where complete wall panels could be connected to adjacent ones to form the enclosure of a house. To make this dream a reality, they purchased an old airplane factory and converted it into a manufacturing facility for these components. However, they were only able to fulfill some orders and eventually their dream of a factory made house was no longer realized. In the 21st century, there are building components with similar characteristics to these architect-designed prefabricated components. One that comes to mind is Structural Insulated Panels (SIPs) which are comprised of insulation sandwiched and adhered to two panels made of wood or steel. Another is Insulated Concrete Forms (ICFs) which are insulated blocks that are spaced apart by plastic spacers to create a void space for concrete to be poured. Although these systems are a step towards the componentized method of building similar to the ones developed by Gropius and Wachsmann, the main difference is that the architects’ systems focused on connection details and smaller sizes to efficiently construct their buildings. A system that shares these architects’ ways of thinking is extruded structural aluminum frames with various profiles. One well-known company is Bosch which makes an aluminum structural framing that can be easily modified and connected to one another using simple hand tools. Creating component systems like the ones Gropius and Wachsmann developed would further reduce the amount of time it takes to erect buildings on site. Prefabricated components are more flexible than assemblies because the same components can be mass produced, delivered to the project site, and easily erected to meet the design intent of the project. These systems can also be combined to create larger components to simplify the construction process even further. Lastly, the most widespread form of prefabrication is the individual parts which refers to standard sized lumber, drywall, ceiling grids, floor tiles, exterior cladding, and so forth. Focusing on the individual parts that come together to create a building is still the most common way that architects design and contractors construct buildings in the 21st century. Some architects and contractors are now mixing between tier 1 and 2 where some components like preassembled roof trusses and individual framing members are part of the construction process. Focusing on individual parts allows greater flexibility where modifying framing members and other building materials could be simply done on site. In many cases, tier 3 assemblies are built in factories or warehouses using the individual parts methodology where individual materials are used in the construction process. Although designing and constructing using individual parts allows greater flexibility on site, it requires a substantial amount of coordination by the contractor to ensure that components being made off-site like millwork and plumbing will arrive and fit into their place. The lines of communication often become cluttered and chaotic where information is lost and components arrive on site, but don’t work within the building tolerances. As the traditional way of building since the middle to late 19th century, designing and constructing around individual parts won’t be replaced, but rather, it will be incorporated into more efficient ways of building. Turning to other industries like automobiles and airplanes, it’s clear that the assembly model and a componentized process of construction allows for more efficient and effective results. Prefabrication in architecture is a term that is defined by the efficiency and ability to bring together individual parts to create components that are combined to create assemblies and delivered to its final destination where it’s finished and inhabited. Individual parts are a form of prefabrication where raw materials have already been processed and transformed into standardized materials. Components are a form of prefabrication where individual parts are brought together to create larger parts of a construction. Assemblies are a form of prefabrication where individual parts and/or components are combined to create nearly complete modules that are delivered and finished on site. I hope this basic overview of the idea of prefabrication in architecture evokes additional thoughts in the ways that we can and should be pushing architecture and construction as we move further into the 21st century. As architects, we can choose the tiers that relate to our ideologies, process, styles, and so forth for all of our projects. Personally, I’m thrilled by the idea of what I’ve referred to as tier 2 “components” and developing systems similar to Gropius and Wachsmann for project 28x30 – 21st Century Kit House. Although their models focused on developing a factory to mass produce their components, I’d like to take a different approach and think of the components as factory made by contractors based on the project. Think of tier 3 assemblies as the result of the tier 2 components that are developed – components are factory made, stacked, and shipped to the site ready for assembly like SIPs. Thank you for reading and let me know your thoughts in the comments section below! P.S. 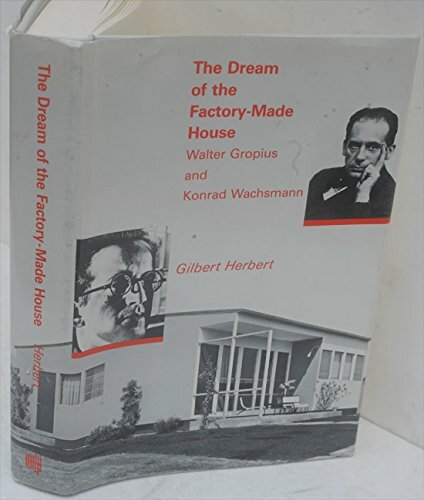 : I was inspired to write this post based on a book that I read for the past month and a half called The Dream of the Factory Made House by Gilbert Herbert about Gropius and Wachsmann’s attempt to bring prefabricated housing to the mass market. It’s a fantastic book that is rare to find these days, but if you’re interested, here’s a link to it on Amazon!